I really want to go there some day. Any reason you made in black and white? 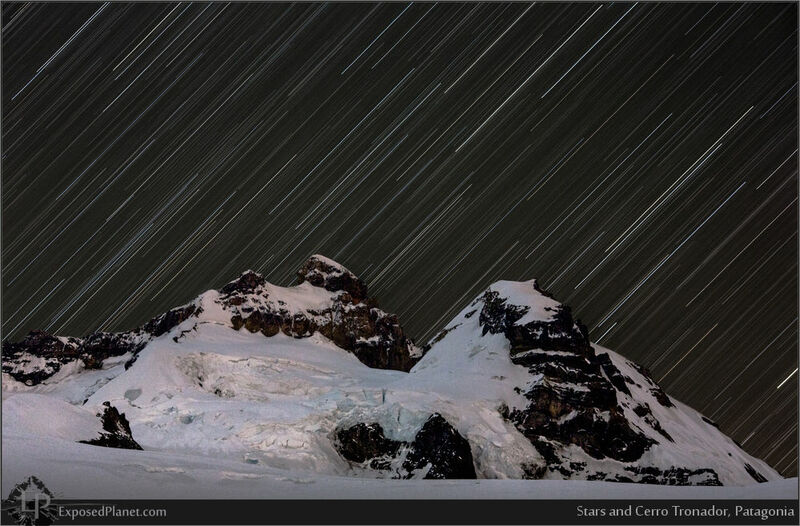 The story behind "Startrails over Cerro Tronador, Patagonia"
Here is a shot that took about one hour to prepare (not including the 6 hr drive and 5 hr hike/ski :) and 16 minutes to take. This is Cerro Tronador, an extinct volcano (though the area is still quite active) of 3400m/11,000ft. It sticks 1500m /5000ft above all neighbouring mountains and is covered in huge glaciers with thousands of crevasses (check Google Earth!). I wanted to use my 135mm 2.0 lens for a long exposure to see how that would work out, but the preparation was a nightmare. There was no moon and the stars on this side were not bright, so live preview did not work when focusing on the pitch dark mountain. Even if I focused on the brightest star, the mountain would be out of focus at F2.0. The depth of field is so limited (and it has the best bokeh ever) on this lens that even at a long distance it is difficult to get everything in focus. Infinity is never infinity at all (or maybe it is, but the mountain was closer than infinity) and even a slight tap on the lens would change the focus distance when at 2.0.